The UV protection built into Marine Armour protects gel coat, paint, rubbers and plastics against aging and fading. With Marine Armour your boat will keep that “brand new” appeal with minimal future maintenance. Barrier against Saltwater, Scum, Oxidation, Exhaust, Stains, Chemicals, and even Fish Blood. Based on the “lotus-effect,” this nano-ceramic allows us to create a smooth hydrophobic surface. This creates a consistent anti-stick factor making it easy to clean away fish gunk or other contaminants without hard scrubbing. Dirt, exhaust, and salt collect at a minimum keeping your vessel cleaner much longer. Metals are better protected against spots and corrosion. Soap and water can be used instead of specialty chemicals when cleaning. This is much healthier for the environment and your wallet. Marine Armor brings strength to the table. This nano-ceramic coating can fortify any surface against scuffs and scratches. Even damage to the coating can be quickly and easily remedied. This comes in very handy on expensive enclosures and electronic screens. Once cured, the coating gets very hydrophobic (water repellent); water rolls off the surface and grabs dirt and grime. This is known as the self-cleaning effect. Hand Washing will be extremely easy and the need for heavy detergents and chemicals are now, in most cases, obsolete. Think about your vinyl seats, no more hard to remove mold build-up, just wash it away with the Textile Armour spray! Marine Armour has proven to be a perfect coating for surfaces exposed to expansion and deformation such as the flexing of a fiberglass hull. The coating wont crack or flake like acrylic sealants. This also allows Liquid Armour to be applied to vinyl and roll-up enclosures. Marine Armour offers protection for both below and above the waterline of any sport boat, yacht, pontoon boat, jet ski, and even surfboards and paddle boards. With the use of advanced Ceramic Nano-Technology, Marine Armour delivers a protective coating that will improve your vessel's performance while protecting it from the elements. Harsh conditions of both Saltwater and Freshwater environments are a well-known problem to boat experts and lovers. Marine Armour offers protection against the corrosion created by saltwater and the fouling on the hull caused by the accumulation of algaes and/or shells, even fish blood! Today’s procedures to clean the boat's hull are exhausting, labor intensive and not very environmentally friendly. Our marine grade ceramic coating will make the surface so repellent to the harsh elements that the cleaning process will no longer be a problem. 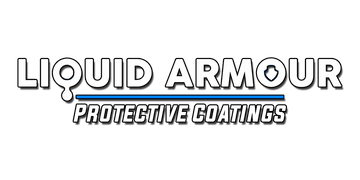 Liquid Armour products are protecting boats around the world. This product is not like other products on the market and has to be placed in a category above the rest. Once the Liquid Armor marine system has been applied to a surface, the need for waxes and other off-the-shelf protective products becomes obsolete. Marine Armour is a clear, non-yellowing liquid nano-ceramic coating. When cured this technology will become an extremely hard yet flexible super-slick glass shield bonding to and protecting the substrate. Marine Armour is not chemically removable by high-detergents or acids. The most unique function of the Liquid Armour Marine System is the ability to reduce drag when applied to the hull bottom. Proven in the manufacturer industry this coating reduces surface tensions creating higher speeds at cruising RPM’s. Less fuel use is a positive side-effect. Therefore, Marine Armor increases a vessel's top speed and acceleration.